We're here. We have not started chemo yet. (-are learning that "got the insurance for Thomas settled" means "several more days of lonnnnng phone calls to various governmental agencies) We have all finally fought off the cold from h-e-double-hockey-sticks. More to come soon. In the meantime, for fans, here is a picture from right before surgery that I love - this is Thomas with his nice friend Andrew, sharing 'Drew's most treasured possession - and the copy of said treasured possession that Andrew's grandma cleverly made. 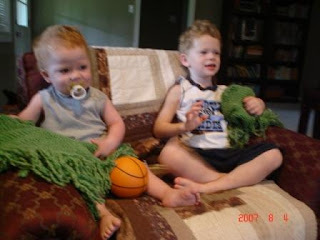 Andrew is a little older than Thomas, but any time they hang out, Thomas takes notes from his hero and we notice little changes in the way he plays after Andrew is gone. It's fun to watch.